He revised. He changed. He edited. By his own estimation, Zusak rewrote the first part of the book 150 to 200 times. In the end, he went back to his original choice and wrote it from the perspective of Death. This time—the 200th time—it felt right. When all was said and done it had taken Zusak three years to write his novel. He called it The Book Thief. The book exploded in popularity. It stayed on the New York Times best-seller list for over 230 weeks. It sold 8 million copies. It was translated into 40 languages. A few years later, Hollywood came calling and turned The Book Thief into a major motion picture. We often think that blockbuster successes are luck. Maybe it’s easier to explain success that way—as a chance happening, a fortunate outlier. No doubt, there is always some element of luck involved in every success story. But Markus Zusak is proof that if you revise your work 200 times—if you find 200 ways to reinvent yourself, to get better at your craft—then luck seems to have a way of finding you. How do creative geniuses come ups with great ideas? They work and edit and rewrite and retry and pull out their genius through sheer force of will and perseverance. They earn the chance to be lucky because they keep showing up. Ditch the dream and be a doer, not a dreamer. Maybe you know exactly what it is you dream of being, or maybe you’re paralyzed because you have no idea what your passion is. The truth is, it doesn’t matter. You don’t have to know. You just have to keep moving forward. You just have to keep doing something, seizing the next opportunity, staying open to trying something new. It doesn’t have to fit your vision of the perfect job or the perfect life. Perfect is boring and dreams are not real. Just … do. So you think, “I wish I could travel.” Great. Sell your crappy car, buy a ticket to Bangkok, and go. Right now. I’m serious. You want to be a writer? A writer is someone who writes every day, so start writing. We all have some type of creative genius inside of us. The only way to release it is to work on it. No single act will uncover more creative powers than forcing yourself to create consistently. For Markus Zusak that meant writing and re-writing 200 times. For you, it might mean singing a song over and over until it sounds right. Or programming a piece of software until all the bugs are out, taking portraits of your friends until the lighting is perfect, or caring for the customers you serve until you know them better than they know themselves. You can make any job a work of art if you put the right energy into it. 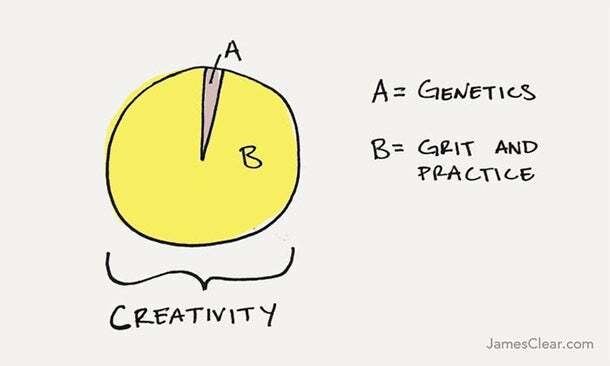 How do creative geniuses come up with great ideas? They work hard at it. A version of this article first published on JamesClear.com. For useful ideas on improving your mental and physical performance, join his free weekly newsletter.